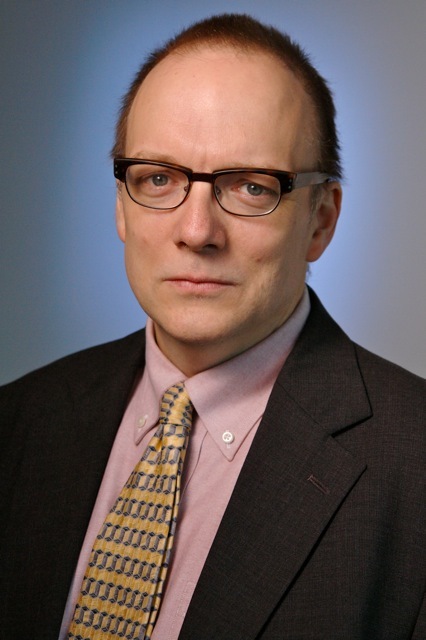 Gregg Brekke, former news director of the United Church of Christ, wrote the article for the July 2013 issue of Sojourners, a magazine serving liberal Evangelical Protestants in the United States. The story is odd in what it leaves out. In particular, it makes no reference to the bombing attack against the Our Lady of Salvation Syriac Catholic Church in Baghdad in 2010. It also omits any reference to the attack against the Two Saints Church in Alexandria on New Year’s Day, 2011. These two bombings highlighted a new era in anti-Christian violence against Christians in the Middle East. It was these attacks that prompted a lot of people who had previously ignored Muslim violence against Christians to admit there was a problem. But instead of acknowledging these acts of violence, Sojourners directs the attention of its readers to Israel, one country in the region where the indigenous population of Christians has increased. The first several paragraphs of the approximately 2,000-word article – almost 20 percent of the text – are devoted to placing the Arab-Israeli conflict at the top of people’s minds when they think about the potential disappearance of Christianity from the Middle East. Prior to 1948, Christians accounted for nearly 20 percent of the population of what is now Israel/Palestine. Today that figure is less than 2 percent. Even more dramatic are declines in the West Bank cities of Ramallah and Bethlehem. Christian populations are nearly extinct in these locations compared to their respective majorities of 90 and 80 percent prior to 1948. What Brekke and his editors at Sojourners are trying to suggest is that the specific population numbers can’t be trusted. If the numbers can’t be trusted, then how can we trust the percentages the magazine offers? What numbers were Sojourners‘ percentages based on? 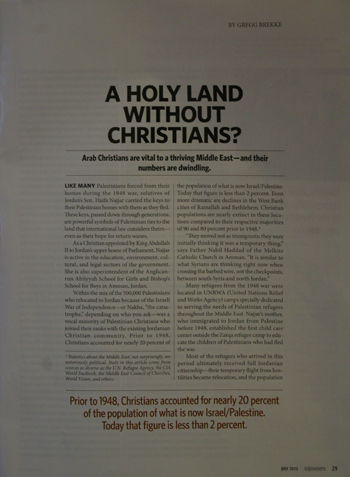 It’s an important issue because looking at the numbers provided by institutions located in Israel and the West Bank, reveals the population of Christians in “Israel/Palestine” (the population that Brekke says is on the verge of “extinction”) has actually increased, not decreased, since 1948. First, let’s look at the actual number of Christians in Israel, where Brekke laments that there has been a decline in the percentage of Christians as part of Israel’s total population. The Statistical Abstract of Israel reports that in 1950, there were approximately 34,000 Christians living in Israel. This figure was not broken down by ethnicity, but the vast majority of these people were Arab Christians. And at the end of 2011, there were approximately, 125,000 Arab Christians living in Israel. So there we have it. The population of Arab Christians in Israel has increased 268 percent since 1949. That’s a dramatic increase that undermines Brekke’s suggestion that Arab Christians are on the decline in Israel. And conveniently enough, he omits it! “Slight increases in Christian immigrants” doesn’t get anywhere near to the truth. The increase in Israel’s Christian population has not been “slight” and it is not due to immigration from outside. The main story of Christians in Israel is not one of immigration, but of natural growth of Israel’s Arab Christian population. There has been 268 percent increase in the population of Arab Christians who were born in Israel. These numbers go a long ways toward explaining why a fast growing Christian population is declining as a proportion of Israel’s total population. As fast growing as it is, the two other groups in the country, are growing at an even faster rate. This does not mean, however, that Christians are in decline in the Jewish state. At this point is reasonable to ask, what needs done to prevent the decline of the Christian population as a percentage of Israel’s overall population that Sojourners finds so alarming? Given that the population growth of Arab Christians in Israel has been pretty strong – an average of 4.3 percent a year, the answer to this question is simple: Constrain the growth of Israel’s Jewish and Muslim populations. Is that what Sojourners wants? Does it really propose that Israel enact policies to constrain the growth of its Jewish population? Its Muslim population? Brekke and his editors at Sojourners are merely using the decline of Christians as a percentage of the overall population in “Israel/Palestine” as an excuse to lump Israel in with the rest of the Middle East, where Christians are being ethnically cleansed from their homelands in huge numbers. what measure? According to a 2007 estimate from the Diyar Institute (described below), there were 7,140 Christians living in Bethlehem City, which had a total population of 25,266. That indicates that Christians comprise approximately 28 percent of the city’s population. Between 1967 (when Israel took possession of the West Bank, the Gaza Strip and Jerusalem) and 2007 there was a 22 percent increase in the Christian population in these areas. In light of these numbers, Brekke (and Sojourners‘) decision to lump “Israel/Palestine” into a story about the potential destruction of Christian communities in the Middle East is shamefully deceptive. The population of Christians declined by 29 percent under Jordanian and Egyptian (Muslim) rule and has increased by 22 percent since Israel took control of the West Bank in the Six Day War. In light of these increases, it is unreasonable (and deceptive) to include “Israel/Palestine” as part of a larger story about the decline of Christians in the Middle East. A more honest way to cover the story would have been to do a sidebar about exactly what is going on in Israel and show how it is going against the trend for the region, where things are pretty disastrous. More than 1 million Christians (out of a total population of 1.5 million) have been driven out of Iraq since Saddam Hussein was ousted in 2003. And at least 100,000 Christians have fled Egypt since Hosni Mubarak’s ouster in 2011. To the article’s credit, the article does acknowledge that Egypt’s population of Coptic Christians has declined from 10 million to 8 million over the past two decades. This might be something that should be highlighted, say with a graphic at the bottom of the page for example. It didn’t happen. Instead, the editors at Sojourners displayed the article in its print version in a manner that, like the text, falsely placed Israel at the center of a story about Christian decline in the Middle East. The message offered by the headline and the cutline at the bottom is that Israel is at the center of a crisis surrounding Christianity in the Middle East. Suppose a pro-Israel magazine did a story about the destruction of Jewish communities in Muslim-majority countries in the Middle East after Israel’s creation in 1948. Suppose (contrary to fact) that there was Muslim-majority country where a sizeable Jewish population had increased by 268 percent since 1948.
pulation than they did 60 years ago. And now suppose this pro-Israel magazine failed to inform its readers about the 268 percent increase in the Jewish population but expressed alarm about the decline of the percentage of Jews in the overall population of this country. Imagine if this lumped this country in with the rest of the Muslim-majority countries in the region where Jews had been driven out in huge numbers. Imagine if it used the first several paragraphs of the story to portray this country as part of the problem. And then imagine the magazine publishing a cutline that further places this country at the center of a story about the destruction of Jews in the Middle East. How would Sojourners and its readers respond to such journalistic chicanery? They would scream bloody murder. Accusations of bad faith would abound. They would accuse the pro-Israel magazine of engaging in a disgraceful attempt to portray the Muslim country in question in an unfairly harsh light. That is what Brekke and the editors at Sojourners did to Israel.